Insanely Clever Ways to Cut Your Wedding Costs and Not Look Cheap! Yash Raj and Sanjay Leela Bhansali movies setting high standards for weddings? Their extravagant sets, expensive looking jewellery and elaborate wedding outfits are something you wish to have for your wedding too? But alas, your bank balance doesn’t fit your dreams, or most people’s for that matter. Right? Weddings are expensive. There’s no denying that fact. From invites to venues - food to favours all round up to a wedding budget that go over lakhs and lakhs of rupees. However, it’s not a hard and fast rule to have a big and lavish wedding. Modern couples are seen opting for small and intimate weddings with their close friends and families in attendance. Couples are also saving a lot on planning destination weddings with cheaper options available out of the buzzing cities. So what if you can’t have a lavish wedding. With these simple hacks you can surely have a fairy tale or intimate low budget wedding, one that will bear your signature and your specific style. Choosing an off season date to celebrate your union cuts your wedding costs straight to half. Since most venues and vendors slash their rates during off-peak seasons, this is your best chance to save on your wedding expenses. So if you’re not the one to be bogged down by Muhoorat dates, pick a day when most people in the country chose not to get married. This will be a significant money saver, availability will be easy and options galore. The timeline between your engagement and marriage also is a factor you can take under consideration. You could either keep the timeline short to avoid shopping like a maniac for your bridal trousseau or on the contrary choose to extend the timeline, so that you can grab your hands on the season sales. Keeping your guest list short and sweet, accommodating only people who matter is a wise thing to do. This reduces your per plate cost. However, ensure you stick to the guest list, yet keep an approximate number to add-on last minute entries; after all it’s an Indian shaadi. 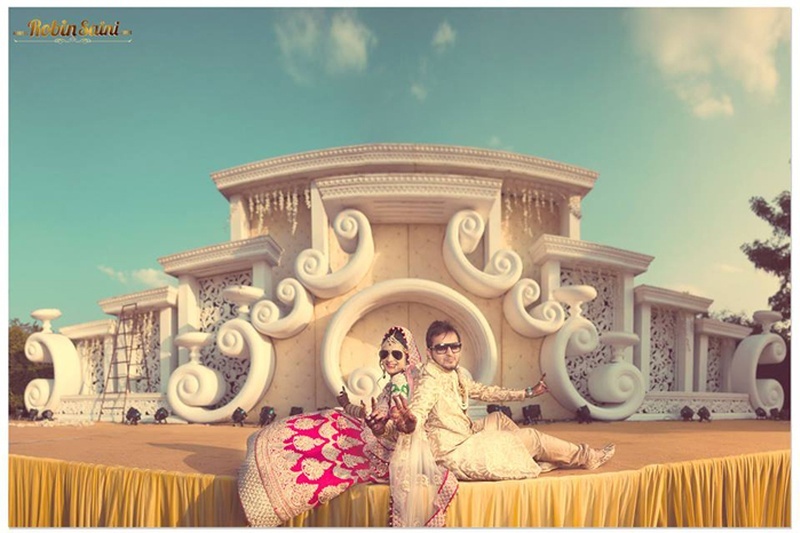 It’s not mandatory to host your wedding in a banquet hall or a garden lawn, choose an unconventional venue. Such as your backyard, building terrace, an open ground, or a friend or family’s home. As mentioned earlier off-peak season venues too are great option to host a low budget wedding. There is always an option of renting or borrowing your wedding outfit, after all it’s just for a day. That heavy work lehenga or embellished saree that you buy for your wedding, will eventually find it’s place in a trunk or a bureau, which you will probably have to air every once in a year, look at it longingly and dreamily and probably never find an occasion to wear it again, lest you end up looking like a bride at someone else’s wedding. What’s the point ladies! Ditto for the grooms! But if you still insist on buying a new bridal outfit, then watch out for dates when designer outfits are on super saving sales. That’s the best time to go berserk selecting from a plethora of choices within your wedding budget. Explore shops and places you’ve never visited before. Create a look book of the various looks you have planned for your wedding functions. Carry this around when you go exploring the lanes and gallies where your dreams are literally and we mean literally, being stitched. Show your looks to small boutiques, tailoring and embroidery shops and masterji. You are bound to find something equally spectacular at prices that’ll buy you three. These unexpected places will amaze you with what they have in store and will also fall easy on your wedding budget. Ditch the idea of keeping a buffet spread or sit-down dinner, instead go classy and host a cocktail reception. This limits the choices of food to selective yummy grub, finger foods and aperitifs and doesn’t leave guests complaining either. Another cheat tip would be, to keep a vegetarian only menu if either of the spouse-to-be is a vegetarian. Where liquor is concerned ask the venue you’ve booked if they allow you to bring your own booze instead of letting them arrange and charge you extra for it. You could also opt to serve a variety of mocktail drinks as a replacement for hard drinks to your guests. No alcohol also equals, no obnoxiously drunk guests trying to photobomb or peeve the others. It’s a win win! A two or three tier cake needn’t be a must-have at your wedding. Go for small and tasteful. No one at your wedding will be sitting with a measuring tape to check the height of your wedding cake. Get a small and beautifully decorated one that should do the job. Besides amidst the array of ice-creams and the dessert counter, you must just be the only one cutting the cake and eating it too! Adding personal touches to you wedding is a major trend. Be it invites or fine detailing as part of the wedding décor, you could easily find cool DIY (do-it-yourself) invite and décor ideas on our blog and online that will make a lasting impression. And the best part of these DIY ideas? They are amazingly light on your pocket. Consider personalized, home made or hand made wedding favours like chocolates, cookies or some delicious besan laddoos wrapped pretty. Edible favours are always appreciated by guests. Framed images of the guests with the bride and groom, a wedding newsletter or even a personalized pen drive with wedding memories are some ideas young couples are now considering as part of the wedding give aways. Don’t behave like a superman or wonder woman to work these out all on your own. Gather all your talented bridal party and get busy together. Can’t afford a professional? Family and friends are always handy to do the job, but an unusual suggestion would be to hire a student. Young minds carry fresh ideas and that’s exactly what will add a zing to your wedding celebrations. Scouting for one might be difficult, but if you get your hands on one, check their work samples and if they’re really good at what they do, don’t let go. When deciding on all of the major factors ensure you first get your hands on all the things that are required on priority basis for your D-Day to run smooth. Stick to your list and strike out all the major components first. Usually vendors request you to make payments in half and half. Ask them if there are any discounts on full payments. Use your bargaining skills to the maximum to get the best rates on all things. This should considerably keep your wedding expenses in control. With major components covered, if you’re still left with some money in the kitty, use it to plan your honeymoon. Thank us later! We hope these budget wedding ideas will help you easily manage your wedding costs. Before you rush to hunt for low budget wedding venues or vendors in your city, do have a look at our listings, we have many choices to fit all kinds of wedding budgets, and great discounts too. You could also shop at our online store for designer bridal wear, jewellery and accessories at awesome prices!